Use scroller buttons to see the whole event list. 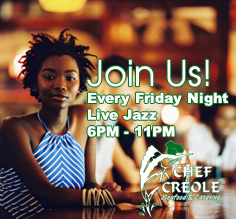 Visit Chef Creole to find out why we are the seafood restaurant of choice for the rich and famous. (C) 2005 Chef Creole All Rights Reserved. Site By Visuwire.